Shuckapalooza is now SOLD OUT. Join us next year for this incredible event. Stay tuned at Virginia's River Realm. If you are lucky enough to be attending and looking for more information about the event, please visit the Shuckapalooza Website. Click on 'Plan Your Trip' at the top, this has all the 'know-before-you-go' information. Virginia’s River Realm is an oyster lovers paradise. 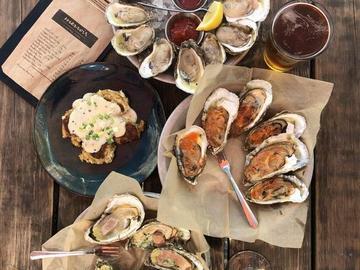 At Shuckapalooza, get your oyster on at the epicenter of the bivalve’s resurgence. Whether it is ecology, history, or pairings with wine and craft beer; Shuckapalooza is your back stage pass. Join in these seven exclusive bucket-list-worthy experiences, rarely offered to the public. Whether it is touring an oyster nursery, seeing some of the latest technology used to open oysters, or letting your palate do the work to distinguish coastal flavors, this is the perfect way to become an oyster aficionado. Proceeds support Friends of the Rappahannock. This is a self-guided tour to 7 oyster experience sites. You will start at the headquarters for check-in and begin your tour to these locations. Must be 21 years or older to sample beer and wine.